Home > 2017 > DARTSLIVE > Online SUSHI ordering system that offers more varieties than any rotating SUSHI restaurants, “SUSHILIVE” unveiled! Online SUSHI ordering system that offers more varieties than any rotating SUSHI restaurants, “SUSHILIVE” unveiled! You can place SUSHI delivery order from DARTSLIVE2 from Sat Apr 1 2017. So, you can enjoy both darts and fresh sushi that is delivered to your home shop from an authentic SUSHI restaurant via this system. To place an order, select “SUSHI COUNT-UP” in MENU on DARTSLIVE2 and select your favorite SUSHI ingredients after the game. Enjoy darts and SUSHI at any shops with DARTSLIVE2! * THEMES will not be awarded if you play in DOUBLES. Please play in a SINGLE game. * THEME only awarded to games played with a DARTSLIVE CARD. 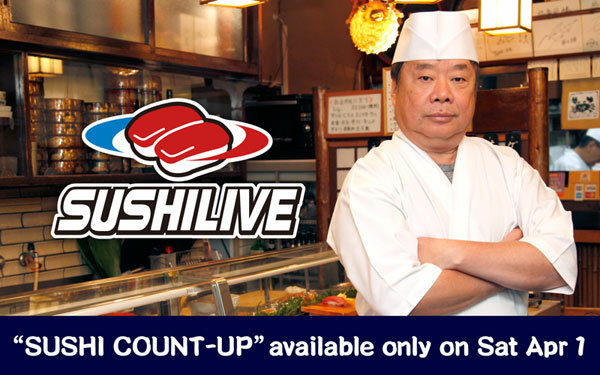 Play “SUSHI COUNT-UP” on DARTSLIVE2 and get the Movie THEME of SUSHI Chef Paul Lim!